What factors contribute to muscle-loss when dieting? How important is the timing of your carbohydrate intake? What exactly are “leverages”, and how does altering them affect your training? Picking-up at the end of last week’s episode, Brad, Andrea, and Eric work together to answer the remaining questions. 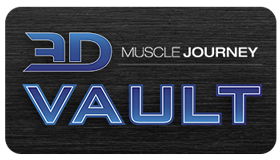 Topics range from: nutrient partitioning, to acceptable exercise substitution frequency, nutritional strategies for bulking, and more. If you found last week’s episode entertaining and informative, you are sure to enjoy today’s episode as well. 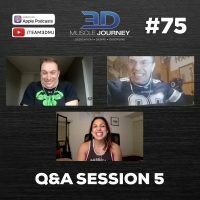 Join us this week for the final episode of 2017 to increase your nutrition and training knowledge base, and to expand your physique enhancing toolbox! Quick first thing – I have to say thanks for all of the articles, resources, courses, podcasts and what have you that you put out. It’s really amazing for us on the ‘user’ side of all this information. I have been listening to your podcasts for a very long time, and have always thought of a couple questions I’d want to ask. I however do not have an Instagram and am not too good with ‘the interwebs’ as y’all say, but figured I’d try to post it here and maybe you will see it. My question is nutrition related, more specifically to calorie and protein timing/cycling. With my limited knowledge of MPS and the underlining biochemistry, I couldn’t really find an answer for myself. Essentially, all of the work, research, and recommendations I have found – much of which from you all, and Dr. Helms especially (congrats! btw Doctor, Sir) focuses on day-to-day protein intake, and this covers the bulk of people’s needs. But I am curious how this plays out further when expanding the time frame – to over 24 hours or even a week. PS: I know Eric talks about this in the M&S Pyramids indirectly with the idea of calorie borrowing, but that is at a much smaller scale than I am asking. This is all mainly coming from a point of adherence strategies. I love food (our relationship needs some work, I’ll admit) and am rarely ever full so having these semi-fast days work well for me compared to just slightly lower days or even PSMF-style days. Annndddd – What about two of these days? where 5 days of the week calories would be even higher? I suppose this is kind of flipping the refeed on its head and instead of 1-3 refeeds per week, I would do 1-3 “defeeds” per week so the other days feel like reefeeds.